When you first begin leash training a puppy, you are not only training him to walk obediently at your side, but he also needs to learn which side (left side) he is to stay on at all times. He needs to learn that his attention should always be on you and not on any distractions that he might come in contact with on the walk. It’s imperative that you communicate to your puppy what is acceptable behavior on the leash and what is not. When it’s time to begin walking your puppy on the leash, don’t expect him to be perfect. Perfection simply doesn’t happen with a young, immature puppy. But remember, this takes time and honest confusion on his part must not be confused with outright disobedience. He’s young remember, he needs time to learn. 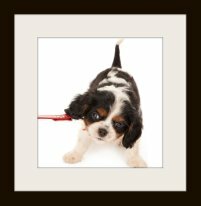 Leash training a puppy is a crucial skill to master for both you and your puppy. It makes walks much safer and manageable which in turn makes walks for both of you a happy experience that the two of you look forward to. 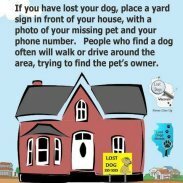 It’s funny how many people are surprised that their puppy doesn’t respond well to a leash or collar – but remember that this really isn’t a natural thing for a puppy. In fact he just might rebel totally to all of this, and don't be surprised if it happens more than once until he gets used to it. rather than trying to re-train an older dog. Ok here's some good news for ya, leash training a puppy is a fairly easy thing to do, AND the earlier you start leash training puppy the easier it is and the faster you see results. BUT re-training an older puppy or dog is very possible, it just takes a little longer to get rid of bad habits. When you start leash training a puppy and begin using the following steps, they should get you up and walking very calmly within a couple of weeks. Some puppies may take a bit longer, but don’t fret, it all comes together if you are consistent with your training and do it daily. Our recent rescue Cooper had it down in a couple of days where as one of our other rescues took a bit longer. It all depends.. just keep a positive attitude. It’s imperative when leash training a puppy that you correct or praise immediately either verbally or with treats. Don’t take forever to correct or give a treat. Puppies learn from association. For example, your puppy lets you put on the collar, then you fumble around for a treat. By the time you give him that treat four or five seconds later, the good behavior is lost, because in those four or five seconds your puppy started scratching or pulling at his collar and you give him the treat; what do you think your puppy has just learned? Your puppy has now learned or associated scratching or pulling his collar gets him a yummy treat. Can you see what I’m saying here, you have to acknowledge good or bad behavior immediately. If he doesn't do what you ask, don't praise or give a treat. As soon as you bring your new puppy home, it’s time to work on leash training a puppy. At this point all you want to do is get your puppy used to wearing a comfortable collar. I like to use a lightweight collar. Remember: Make sure you have some tasty training treats ready in a pouch that is either attached to you or easily and quickly accessible. When you first work at putting the collar on your puppy, take the time to play and treat him while showing him the collar. This helps him to associate the collar with something happy and enjoyable. This isn’t the right behavior you want, so don’t praise, give treats or even take the collar off at this point. If you do, he will associate that behavior with being able to have the collar taken off. You may need to try redirecting his attention from his collar to something else like one of his toys. Don’t treat yet just get his mind off the collar. Once he has settled down and forgotten about it, then you can take it off, treat and praise him. As soon as the puppy is happy and content wearing his new collar, it’s time to start leash training a puppy. Start this out in the house where the environment is quite and there are no distractions. 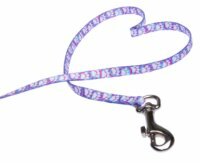 The best type of puppy leash is one that is lightweight and made of nylon or fabric, anything else is just too heavy. Here again you want to introduce the leash as something happy and positive. Use the same technique here as you did with the collar. Let him sniff it and check it out. Now go ahead and clip it to his collar and let him walk around the house with it dragging loose on the floor, supervised of course. I usually have a number of his favorite toys around for us to see and play with. When playing, be sure that it’s the toy that your making attractive to him, not your arm, hand or leash. Typically the puppy will forget about the leash after a bit. SUCH PROGRESS! Make sure that the first leash training puppy sessions are short and fun! Always use happy, positive words and treats during training so he sees this as a positive experience. When you begin leash training a puppy on the walk, you will want to show an attitude of confidence and fun. Walk with a spring in your step and act like you know what your doing. Puppies can feel if you are tense, worried, happy etc. Really they can. Your attitude contributes to how your walk will go. Now that he’s used to the collar and the leash, it’s time for you to pick up the other end and walk around the house with your puppy walking happily beside you. As he is walking with the leash loose give him tons of praise, petting and even some yummy treats. If he starts to pull on the leash, stop immediately. Don’t yank or drag him back, instead call him over to you and praise him when he is coming and has returned. And yes, I think a yummy treat given immediately at the point he reaches you is a great incentive. Remember puppies learn by the association, he thinks “hum, when I come when she/he calls, I get a boatload of praise and yummy treats!” He likes this, believe me. Again, never ever keep walking when he is pulling on the leash because this will only reward his bad behavior and reinforces the bad habit. When leash training a puppy, he needs to learn that when he pulls on the leash, the walk stops. He soon realizes that if he wants to continue with the walk, he has to be at your left side and walking with a loose leash. If your puppy sits down while you are on the walk, same rules apply, don’t yank, call him over to you, praise and treat immediately for his correct response. Then continue with the walk. Once you have conquered leash training a puppy inside the house, it’s time to take it outside for short walks around the backyard, not the neighborhood yet because he isn't fully vaccinated and could catch a life threatening disease. Again, make sure to reinforce when your puppy is doing what he is suppose to do, giving praise and treats. If he starts pulling or sits down, stop the walk, call him to you, and then praise and treat him for the correct behavior. The one thing you don’t want to do, is start babbling “heel, heel” as you try to walk. Your puppy doesn’t need constant orders from you in order to behave correctly. Always praise him when he does well, but resist the temptation to “run at the mouth” with commands or yelling. As you go along with further types of training, you will see that he will learn quite quickly how to pay attention to a silent owner. So Whats Your Ultimate Goal? 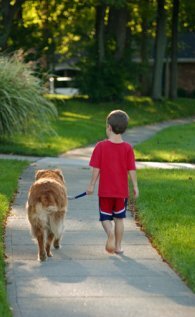 When leash training a puppy, you ultimately want to be able to walk with your puppy without either of you pulling or tugging at the leash. The lease should be able to dangle loosely between the two of you, (without tripping either of you) giving both of you a very enjoyable, pleasant walk without any stress. These leash-training steps are designed for young puppies, which teach the basics of puppy leash training. If followed daily with a bit of patience and persistence, you will have your puppy leash trained. And always remember to have fun with puppy training. Results don’t happen overnight, but the joy it will bring to the both of you is priceless. Are You The Alpha Of Your Pack?